On 6 December 2012, the commemoration day of the Holy and Right-Believing Prince Alexander Nevsky, Metropolitan Hilarion of Volokolamsk, chairman of the Moscow Patriarchate’s Department for External Church Relations, rector of the Ss Cyril and Methodius Church Postgraduate and Doctoral School and chairman of the Synodal Biblical and Theological Commission arrived in Nizhniy Novgorod with the blessing of His Holiness Patriarch Kirill of Moscow and All Russia. 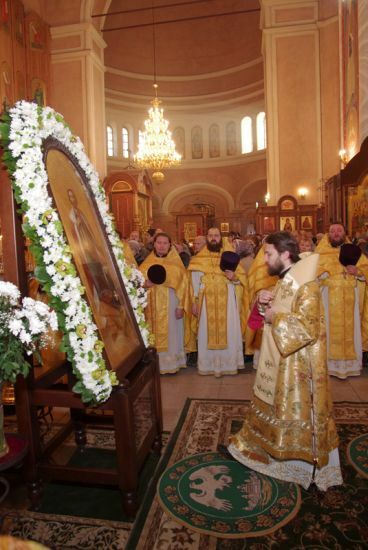 The DECR chairman began his working trip with the Divine Liturgy which he celebrated together with Metropolitan Georgiy of Nizhniy Novgorod and Arzamas and clerics of the diocese at the Cathedral of St. Alexander Nevsky on the dedication day. After the service, the archpastors exchanged greetings. Metropolitan Hilarion conveyed Patriarch Kirill’s blessing to the head of the Nizhniy Novgorod diocese and the worshippers and added that His Holiness has a special reverence for the Holy and Right-Believing Prince Alexander Nevsky, as “His Holiness was born in St. Petersburg and raised spiritually at the Laura of St. Alexander Nevsky, where he was ordained deacon, priest and was consecrated bishop. “His Holiness always reminds us that St. Alexander Nevsky gives an example to all citizens of our Fatherland, and particularly to those vested with civil and political power. “Looking at the glorious and tragic history of our fatherland, we see that it prospered when the rulers turned to God… It happened during the time of St. Alexander. “Out nation has been chosen by God to keep the holy Orthodox faith. We live ‘at an acceptable time and on the day of salvation (cf. 2 Cor 6:2), as the people and the rulers turn to God and to eternal spiritual values that have always been the basis of spiritual and material wellbeing of Holy Russia. ‘The image of St. Alexander Nevsky is a guiding star for many people today. His exploits remind us that one can enjoy power and strength and be at the same time a true, kind, humble and meek Christian who seeks the Kingdom of God and His truth.